The World Cup is upon us, and to be honest I never had any interest in sports other than baseball until the past two years. I've really gotten into basketball (I cannot tell you how excited I am for March Madness next year) and now with all of the hype around the WC, I've done my research on all the basics -- and then some. Plus you all know my obsession with the word WAGs (wives and girlfriends), which is a primary word used to describe the ladies of the WC. Obviously I had to know which guys I should be aware of. I have found finding that something I'm initially interested in leads me to want to know everything about that subject. A prime example? 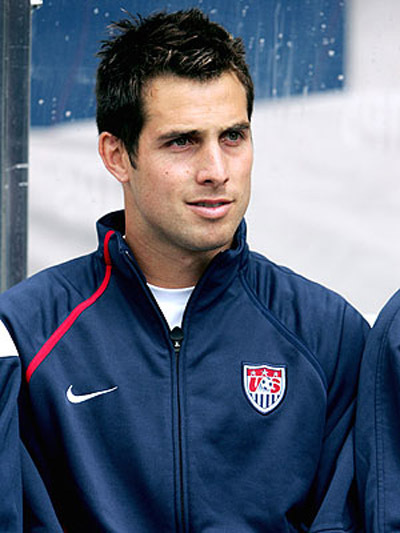 I just found out that the Captain of the United States National Team is a MAJOR hottie, and based on some forums I have read, it turns out he's a total gentleman and an overall nice guy. This makes me excited, so I went ahead and learned all of his stats and then went on to learn about the US National Team's stats. Can I just call it Team USA? I mean I want to be correct and everything so please let me know. So, ladies, here he is. If he doesn't make you want to buy a USA jersey, I don't know what would.